All I have to do is pick up a can of aerosol spray and my dog starts sneezing… even if she’s on the other side of the room. I haven’t even sprayed it yet and she’s sneezing! It’s so funny. She knows from experience that the aerosol spray will make her sneeze so she gets a head-start. She does it with any aerosol can… hairsprays, disinfectant sprays, air-fresheners. She’s such a little goof-ball. After researching the subject, it’s probably a good thing that she sneezes! Maybe her sneezing is helping to rid her nasal canal of what is being sprayed into the air. If she does happen to ingest (via her nose) what is being sprayed, it could be very harmful to her. I’m reading that aerosol sprays contain chemicals like formaldehyde, xylene, and various other VOC’s. What are VOC’s? VOC stands for Volatile Organic Compounds. You would think that something with the word “organic” in it would be a good thing, but not in this case. VOC’s are gasses emitted from a variety of chemicals which are known carcinogens and neurotoxins. And we’re not even talking about the cleaning chemicals that are inside the cans yet… we’re just talking about the substances used to propel them into the air! Many years ago, the late 70’s to be more specific, aerosol cans were banned because of increasing evidence that they were damaging to the earth’s ozone layer. I can’t help but wonder… if they were that harmful to the earth’s ozone, what were they doing to us and our pets? Anyway, in the late 80’s a new aerosol can was developed using other propellant gases – propane, nitrous oxide, hydrocarbons, etc.. The ozone problem may have been eliminated, but another one was created. The new aerosol cans contain many harmful VOC’s. Harmful to us and to our pets. Although we can’t really see them, when a VOC is dispersed into the air, it forms a little vapor “cloud”. When we breathe, those chemicals are carried directly to the olfactory receptors in our noses. Just imagine the intensification of those chemicals when they reach our dog’s super-human olfactory system! Because of our dog’s extraordinarily adept receptors, they experience odors quicker and stronger than we do. Aerosol cans are not the only things that contain VOC’s, but so many of the cleaning liquids, powders, and sprays we use contain VOC’s, and that’s the main villain in this story. The ingredients used in common household products have been linked to many cancers, neurotoxicity, asthma, and reproductive disorders. Chemicals can enter our pet’s bodies just through breathing alone…they don’t have to actually lick or eat the substances to be affected. Differences in a dog’s age, health condition and how much or how long they are exposed to the chemical are all factors in how it will affect their health. Even short-term exposure to high levels of some VOC’S may cause nausea, eye irritation, and respiratory irritation. These things usually go away after the exposure stops, but the long-term, accumulative effects of the VOC’s can affect the liver, kidneys and nervous system. Let’s think of the cleaners we use on a regular basis… Bleach, ammonia (Window cleaners), carpet cleaners, floor cleaners, dishwashing liquid, clothes detergent… All of which contain unhealthy VOC’s. Right now I’m looking at the warning notices on nearly every cleaning product in my cupboard and I am astonished! Most just say, “hazardous to children”, some say “hazardous to children and pets”. Many are “general” warnings, pertaining to any living being within the range of use. Scary, huh? Warning labels of any kind are not to be ignored. So what do we do? We want a super clean, nice-smelling, sanitary home but we certainly don’t want to harm our pets in the process. We just bought a floor steam cleaner for our home. We have mostly hardwood floors and it is amazing what the steam mop has picked up… And that’s after we had already mopped the floor numerous times with other floor cleaning products. It cleans and sanitizes very, very well. And if you want it to smell good, you can add some essential oils to the mop-head. They do not recommend adding it to the water/steam itself. Some people add a little vinegar to the water. I personally do not like the smell of vinegar so I haven’t tried that, but if you like that smell, give it a shot! You can buy hand-held steam cleaners for tubs, showers, countertops, and nearly anything else you want to clean. Murphy’s oil soap is fairly safe to use around pets, in fact, it is recommended several places online as a bath soap for dogs (I’d be careful about that… ask your vet for his/her opinion). 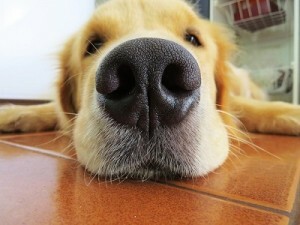 Your pet could become sick if they ingest Murphy’s oil soap directly, or if they get it in their eyes or on their nose. It is not a good idea to expose them to it full strength. Proper dilution of Murphy’s Oil for use as a cleanser in your home is a much better alternative to many of the chemical cleaners on the market. Many air purifiers are safe for pets, but please, do your research. There are so many on the market and some have ozonators or ionators that can be harmful to pets under certain circumstances. Read the warnings. Baking soda is not just good for baking cakes. If you look at the label, it is able to clean and remove stains from nearly anything, from pots and pans to toilets to teeth! Castile soap (i.e., Dr. Bronners) is a great, multipurpose cleanser that you can use virtually anywhere in the home. Many people use some of their formulas to bathe pets in also. Personally, as I mentioned before, I don’t like the smell of vinegar, but I can’t deny it’s ability to clean nearly anything and everything. Safely. No matter how innocent their concoction sounds, keep clear of any aerosol sprays. Pumps and mechanical pressure dispensing are much safer alternatives. Citrus oils are in many cleansers on the market today. They sound innocent enough, but often times these oils are added to other chemicals in the formula. Be sure to read the ingredient list. Keep in mind too, that all natural oils can irritate the skin in their purest state. Not just citrus, but also cedar and pine. Use caution. Method – their products are pretty amazing too, and conveniently available at Target and Walmart. Method’s website states: “Method’s entire product line is safe for use around pets and is specially formulated to put the hurt on dirt without harming your furry friends.” Now, that’s what I’m talkin’ about! Error: Error validating access token: Session has expired on Monday, 29-Oct-18 09:08:51 PDT. The current time is Thursday, 18-Apr-19 19:26:46 PDT.